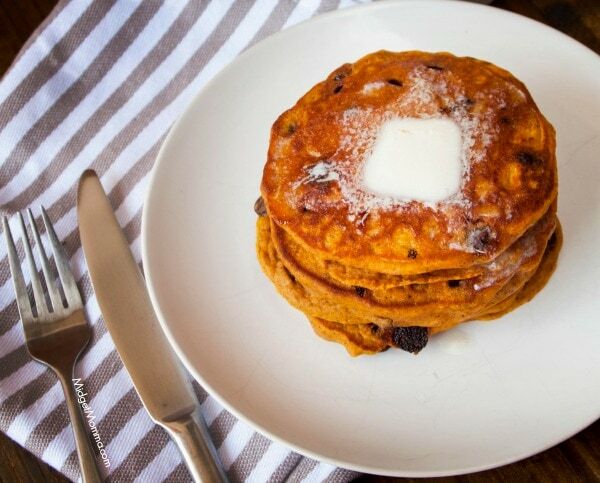 It is officially fall that means our normal pancake Saturday is now pumpkin pancake Saturday. These pancakes are the fluffiest pancake I have ever made before! They have that great pumpkin pie flavor with the help of my homemade pumpkin pie spice mix . I also love using my home made pumpkin puree when I can get my hands on fresh pumpkins. If you can’t get or don’t feel like making your own pumpkin puree don’t worry about it use canned pumpkin. I have used it before and It taste very similar if you use the Libby’s brand of pumpkin puree. The key to these pancakes it not to over mix the batter once you add in your flour. If you over mix it than the gluten starts forming stronger bonds and they lose that light and fluffy texture. 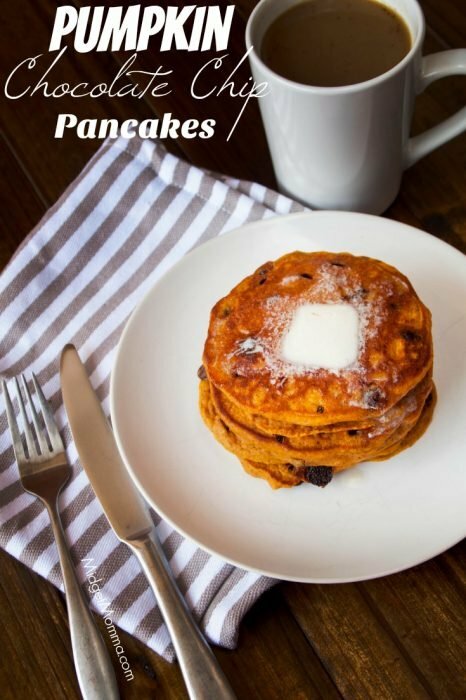 Preheat your griddle to 350 degrees or your frying pan over medium heat. In a medium mixing bowl whisk together the flour, baking powder, baking soda, salt, cinnamon, pumpkin pie spice and chocolate chips, set it aside. In the bowl of your mixer combine the pumpkin, sugar, egg, oil and buttermilk. With the whisk attachment whisk these ingredients together until they are lighten and smooth, about 1 minute. Remove your bowl from the mixer and gently stir in the flour mixture just until it has started to combine. Do not worry about lumps they will work themselves out. With a 1/3 measuring cup scope out your pancake mix out onto your hot pan. Cook on each side until golden brown. Enjoy warm with some butter and maple syrup.